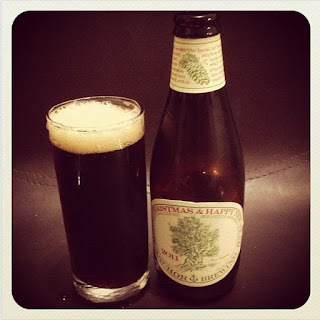 The Genuine Beer Blog: Merry Christmas & Happy New Year Beer 2011 !!! Hey Everyone, Sorry there hasn't been a blog post for the last couple of days, have been mad busy on the run up to Christmas, tonight we are back with the 12 Beers of Christmas, Hope you enjoy !!!! Merry Christmas beer is a very interesting, deep, full flavoured beer. This beer is heavily spiced with Christmas spicing. This beer has a real fruity flavour to it, brings out all the characteristics of Christmas. To me this beer really catches the essence of a Christmas Pudding in flavour, those deep, all spice qualities, with the fruit notes. This beer is heavy on aroma, with the fruitiness being at the forefront, however the taste of the beer is more subtle. There is a real fragrance to the taste of this beer also. Merry Christmas and a Happy New year beer changes its recipe every year, so these characteristics may be different in the 2012 variety. This is a very seasonal beer and would be enjoyed by anyone that enjoys the deep, rich flavours associated with Christmas. This is definitely not a beer for the faint hearted. Merry Christmas beer is a smooth, full flavoured beer, with dried fruit and Christmas tasting qualities to it. 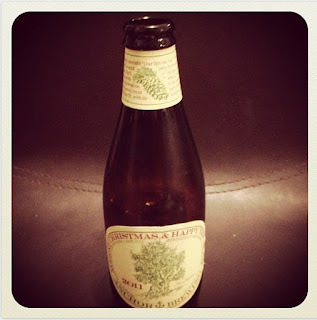 A nice beer, however it was a little sickly after a while, probably enjoyed in small doses. On the whole a nice beer, to enjoy on occasion throughout the Christmas period.